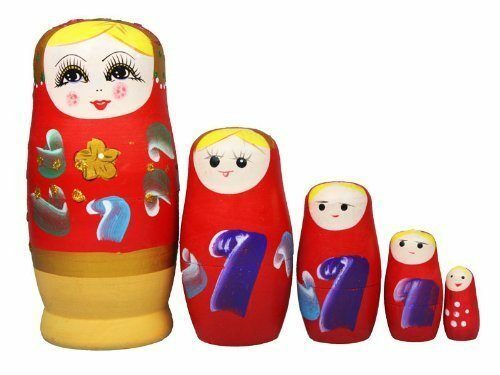 Set of 5 Russian Nesting Dolls Just $4.59 Shipped! You are here: Home / Great Deals / Amazon Deals / Set of 5 Russian Nesting Dolls Just $4.59 Shipped! Get this Set of 5 Russian Nesting Dolls for just $4.59 on Amazon! Shipping will be FREE, too! My boys love playing with a set of nesting dolls that we have. Fine workmanship wooden handmade 5 set Cutie Nesting Dolls Matryoshka Madness Russian Doll. Each contains five layers doll. Bright smooth surfave with exquiste draw is so lifelike model and elegant appearance. Nest all Five matryoshkas together or display all five. Children’s great toy and wonderful decoration for house.